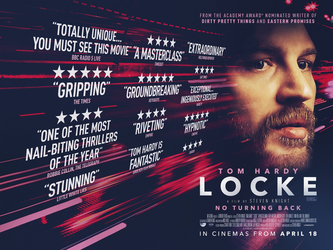 Locke is one of those films that makes a mockery of the rating system. Should I rate films based purely on my enjoyment? Or should I rate on how successfully the director and actors achieve what they set out to do? Locke is an interesting film to consider both these points of view. On pure enjoyment, the film is probably a 3/5 for me, but for achieving its goals, it’s a 5/5. I’ve gone for the happy medium of 4/5, but let me discuss in a bit more detail why I’m inclined to lean that way. The film is 80 minutes long, takes place entirely in a car, on a stretch of motorway between Birmingham and London. The only person we ever see on screen is Tom Hardy’s Ivan Locke, although most of the drama comes from phone conversations with various people (Olivia Colman, Ruth Wilson and Andrew Scott providing the main voices). The premise itself, even within these confines, is fairly mundane, and its testament to the skill of Steven Knight’s direction and Hardy’s powerful performance that this film is so deeply compelling. Ivan Locke is a construction worker who’s just finished a shift before setting off for London down the motorway. Phone conversations with colleagues and relatives reveal deep conflicts within his head, and start to establish the drive behind the narrative. It doesn’t work without a strong central performance, and Tom Hardy is as good as anyone in the game at the moment and he absolutely commands the screen. We learn about his character, and we think he’s a good man who’s made some mistakes – essentially we are rooting for him as he struggles to deal with things going on at work and at home. It’s testament to the quality of filmmaking that the film doesn’t resort to a more dramatic allure for this kind of confined storytelling ( ie Buried – a man was buried alive and had to get out), and manages to find tension in the ordinary, in the workplace and at home.